Sher-e- Kashmir University of Agricultural Sciences & Technology, conducts Walk-In-Interview for the the posts of Asstt. Professor/Jr. Scientist/Subject Matter Specialistw. Postgraduate qualification in the concerned subject. Ii. Ph.D degree in the subject concerned. Age :Not less than 20 years and more than 55 years as on 01.01.2012. Application forms complete in all respects duly supported by attested copies of all the certificates & testimonials and accompanied by Demand Draft for 1500 should reach through Registered/ Speed Post to the office of the Registrar, Sher-eKashmir, University of Agril. Sciences & Technology of Jammu, Chatha (J&K) -180009 by or before 15-06-2012 upto 5 p.M. Two self-addressed envelopes of size (9' x 4') duly affixed with postage stamps of 30/ each should be enclosed with the application form.Envelope containing the application form should be subscribed as “Application for the post of __________________”. 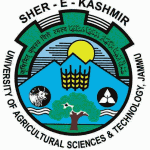 The Sher-e-Kashmir University of Agricultural Sciences and Technology, J & K was established in the year 1982 with the objectives of catering to the research, education and extension education requirements of the state. A demand for the establishment of a separate Agriculture University for Jammu region was projected as agro-climatically and topographically, the Jammu region is different from the Kashmir division having diversity among its livestock, type and pattern of cropping and socio-economic/geographic linkages. The problems of Jammu region are location specific in research on crops, pulses, fruits, oil-seeds, vegetables, agriculture, species of livestock and poultry.